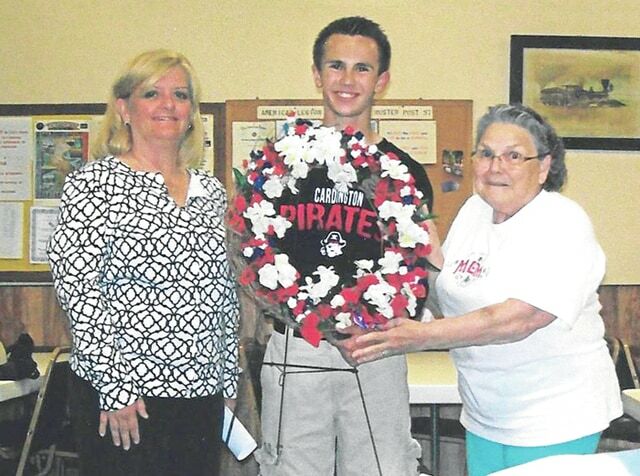 Courtesy Photo L-r: Donna Kill, teacher, with Quinn Maceyko holding the wreath made by Shirley Dendinger, right, to be placed on Memorial at Washington DC. When members of Jenkins-Vaughan Unit 97 of the American Legion met in regular session on May 19, they heard Quinn Maceyko tell of his trip to Washington DC two years ago when he and Allyson Moore laid a wreath at the Korean Wall and the deep feeling of awe and respect for the soldiers that they experienced visiting these walls of remembrance. Unit member Emily Waters had laid the wreath at the Tomb of the Unknown Soldier when she and her class made the trip and she remarked on her feelings at the time. Donna Kill, teacher, who along with Troy King, plan these trips and accompany the students was present at this meeting. She said because they plan their visits ahead, they will be going earlier next year. Placing the wreaths this year were Brianna McConnell and Heather Sparkman, Vietnam Wall; and Shyla Bennett, Katie Lester and Gabrielle Snodgrass, Korean War Monument. This class and the English class are writing letters to be given to an Honor Flight veteran when he returns from his visit to Washington DC. The unit agreed to provide the wreath for the class this year. Shirley Dendinger made the wreath. The unit also agreed to purchase two new wreaths for Memorial Day at a cost of $60. It was reported $721.10 was collected on Poppy Days held May 15-16. The unit also agreed to give all the profits from the Wigton Auction sale and from the District meeting to Post 97. Under Membership, it was reported by Betty Cook that the unit has reached 74.79% of its goal with no new members this past month. The unit also agreed to send four girls to Buckeye Girls State this year because the 6th District has openings for three more girls at no late fee charge. Unit members agreed to donate $50 to the Cardington Beautification Committee. The last meeting of the season will be held June 16, 2015.